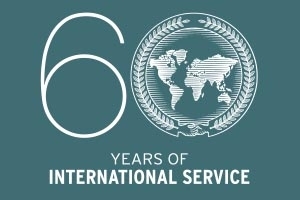 In the 60 years since American University first broke ground on the School of International Service (SIS) building in 1957, SIS has educated and prepared students to wage peace and lead through service in the US and around the world. Throughout this academic year, we will celebrate SIS's 60th anniversary with a series of feature stories on a dedicated website and with special guest speakers who will bring the history of SIS to life and highlight the evolution of what it means to wage peace. When SIS was in its infancy, the first dean, Ernest Griffith, conceived of the school as "much more than its building." He believed that within the programs offered at SIS "are woven the ideals of our nation and our faith, especially as these ideals relate themselves to the service of our people, to those of other lands, and to the great cause of world peace." Today, Interim Dean Christine BN Chin connects the uncertain world in which SIS first opened its doors to today's global challenges: "The School was born in the midst of the Cold War, when the world was in uncharted territory. If you look at what's happening in the country and the world today, we exist in yet another time of uncertainty and uncharted territory. Given who we are, the School of International Service will continue to chart our own path." In 1953, looking ahead to a time when the US-Soviet rivalry no longer dominated US foreign policy and world affairs, President Dwight D. Eisenhower gathered together the presidents of 13 universities and urged them to assume the responsibility for offering international affairs programs of greater significance. AU President Hurst Anderson was among those university leaders gathered and shared his vision for a school devoted to international affairs with Eisenhower. The School of International Service grew out of American University's Department of International Relations and Organization, created in 1935. The department was originally housed in the Graduate School and awarded associate degrees, BAs, MAs, and PhDs. In 1956, the department had 11 faculty members, nearly all of whom became SIS faculty after the school's establishment. During its first year, SIS had 10 full-time professors and an additional seven part-time faculty. Today, SIS boasts 120 full-time faculty members. The dream to create a school that responded to President Eisenhower's call became a reality when the Methodist Church, with which the university had long been associated, gave American University a $1,000,000 grant to establish the School of International Service. About $375,000 of the grant went towards costs for the original SIS building, which is now the East Quad Building. SIS's groundbreaking ceremony took place during commencement on June 9, 1957. Along with AU President Anderson and SIS Dean Griffith, US President Dwight D. Eisenhower attended the ceremony and helped break ground on the building site. He offered the following words to those gathered: "Good wishes to all students who will enter that school to go into the service of our country in the noblest work that our nation can possibly pursue, and that is the seeking of a peace based on justice and the right." By the time classes began on September 18, 1958, SIS had enrolled 30 freshmen, 10 transfer students, 25 full-time graduate students, and 63 part-time graduate students. Today, SIS has almost 3,000 students from more than 130 countries enrolled. It is the largest school of international affairs in the United States and ranks among the top 10 schools for undergraduate and graduate degrees. During the school's first years, SIS students could choose from six available programs: foreign service, overseas business, church missions, overseas representation, international administration, and international relations and organization. Today, SIS offers more than 20 graduate programs of study, which are complemented by the abundant resources and possibilities of its Washington, DC, location. The first SIS graduating class consisted of 13 MA students who walked at the Spring 1959 commencement. Students hailed from around the US, as well as from Iraq, Lebanon, and Turkey. Spring 1960 commencement saw the first eight BA students and three Master of International Service (MIS) students graduate. In SIS's founding academic year, tuition cost $350 per semester for undergraduates and $18 per credit for graduate students; a shared dormitory with one roommate cost $130; and a meal plan that included three meals a day cost $230. Dean Emeritus Louis Goodman began his 25-year run as dean of the School of International Service in 1986. Of his time in the role, Goodman said that "there seemed to be no end to the opportunities to develop SIS." The development of the School of International Service and the opportunities it has both seized for itself and created for its students and alumni continues. At SIS's groundbreaking ceremony, President Eisenhower said that "the waging of peace demands the best we have, the best young men and women that we can find to put in this great effort which must go on around the world all the time." Just as SIS has remained true to its core values and Eisenhower's call to wage peace throughout its 60 years of history, it will continue to do so in the decades ahead.